Marshmallow Man to Ironman: Ontario Highway Traffic Act - New Laws Effecting Cyclists! Ontario Highway Traffic Act - New Laws Effecting Cyclists! New laws are about to take effect in Ontario, and a lot of them impact cyclists. 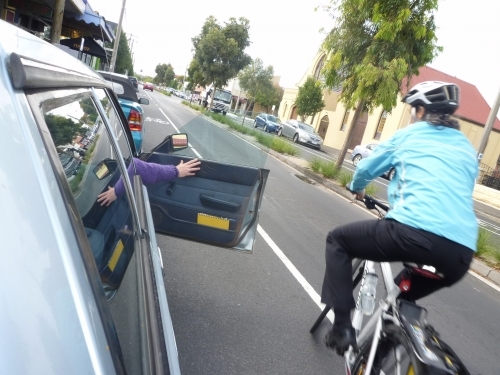 "Dooring" a cyclist will be a $1000 fine. Still a good idea to stay out of the door zone, but at least there is a recognition about how seriously dangerous this can be. 1 meter clearance while passing cyclists - this one is long overdue - motorists will have to leave 1 meter of space between their vehicle and a cyclist, or face a whopping fine. Legal to ride on paved shoulders - previously it was illegal, although common practice. The law is now changing to allow us to ride on paved shoulders. This article from the National Post runs down the rest of the law changes (they aren't all about cyclists!). This is the actual act.